FREIGHT FREE - In continental USA! The RG25 Traveling Irrigation Sprinkler is a perfect choice anywhere portable, unattended irrigation is desired. Traveling sprinklers eliminate the need for manually moving hoses or sprinklers from place to place. The RG25 is completely water powered using a field proven and efficient turbine drive system which utilizes the flow and pressure from your garden hose to retract the reel at the speed you choose! Simply attach the water hose to the inlet fitting on the stationary base unit, release the turbine drive, and pull the hose cart and sprinkler to the opposite end of the irrigation lane. Then, return to the base unit, re-engage the turbine drive, set the automatic shut off valve, start your water, and the RG25 will do the rest! It will also automatically shut off when finished! Click the images at the right to view a close up of the machine and notice the durable construction and manufacturing components used on this excellent product. Performance summary attachment detailing the RG25's wetted coverage may be viewed by scrolling to the bottom of this page. RG25 may be ordered with standard gearing for normal turf or vegetation watering, or "high-speed gearing" for dust suppression in horse arenas. When ordering please select "RG 25-HS" if choosing the high-speed gearing option for dust control applications. NEED ARENA DUST SUPPRESSION? 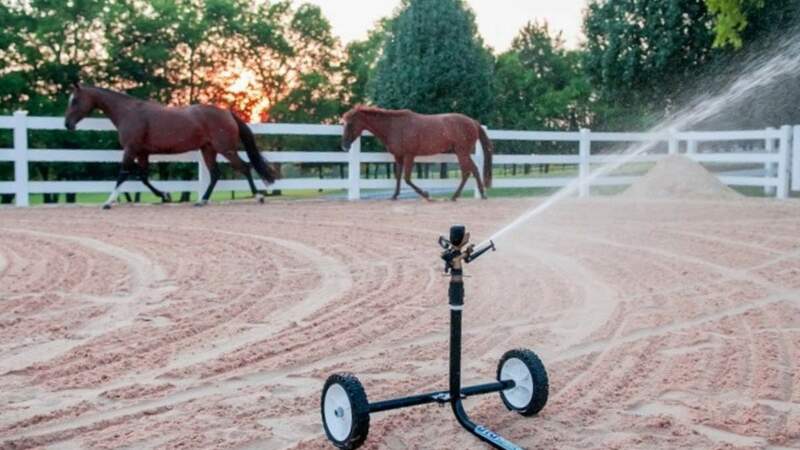 Aren't we all tired of hand watering horse arenas and dragging leaky hoses and sprinklers through the arena in an effort to keep our footing properly maintained? Well, say no more! The RG25 Traveling Arena Sprinkler is the perfect watering machine for small arenas such as dressage rings, indoor rings, small performance arenas, etc. Best of all, the RG25 is internally geared for arena watering and completely water powered using a field proven and efficient turbine drive system which utilizes the flow and pressure from your garden hose to retract the reel at the speed you choose---No Labor Involved! Simply attach the water hose to the inlet fitting on the stationary base unit, release the turbine drive, and pull the hose cart and sprinkler to the opposite end of the irrigation lane. Then, return to the base unit, re-engage the turbine drive, set the automatic shut off valve, start your water, and the RG25 Automatic Arena Sprinkler will do the rest! It will also automatically shut off when finished; leaving a dust-free arena that is evenly watered and ready to be used! This is an investment that horse and rider will benefit from for years to come! Click the images at the right to view a close up of the machine and notice the durable construction and manufacturing components used on this excellent product. Performance summary attachment detailing the RG25's wetted coverage may be viewed by scrolling to the bottom of this page. 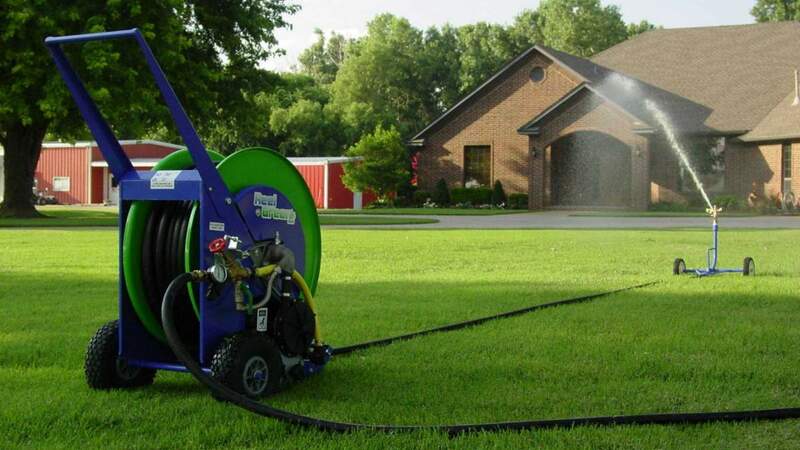 The ReelGreen model RG25 Hose Reel Irrigator operates between 3 and 12 gallons per minute (by selecting from the 3 nozzle sizes included), from a 3/4 inch garden hose connection, and pressures between 35 and 60 PSI. This model is fitted with 165' of .80" poly hose for maximum wetted areas of up to 90' wide and 200' long! The speed bypass valve allows the user to select a speed that matches the desired irrigation application rate. If pressure boosting is needed, our 3/4 HP Booster Pump is a great match to the RG25 and will boost pressures up into a maximum operating range for excellent water uniformity and coverage. These field-proven traveling sprinklers feature "all steel" construction, cast aluminum water inlet with replaceable seals, brass shut off valves, and heavy-duty 3/4" brass Rainbird sprinkler for years of reliable service. Compared to other brands, ReelGreen Travelers offer superior construction and utilize all water entering the system with no exhaust or wasted water around the machine. Order yours today and start watering the labor-free way! Ships FREIGHT FREE in the continental USA!